Are you allergic to perfume or other scented products? 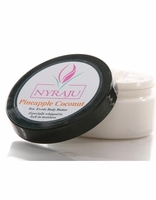 Or would you like to scent your body butter with your own signature scent? An unscented body butter will be the choice for you. Rich in Shea Butter as its base, the unscented body butter will hydrate and moisturize your skin to feel soft and smooth. How To Use: Unscented, you can slather this butter on every part of your body. In colder climates you can even use it on your face but just less of it. I love this unscented body butter. I was buying perfumed butters from the store and they were making me ill. I later found out that the scent blends were more synthetic than natural. Juliette sat me down and showed me how to experience different essential oils. I have actually created my own signature scent blend. Yeah Me! I love what I now wear and my skin feels so soft and smooth. From unscented to scented I can have it both ways. I love the idea of being able to hydrate and moisturize my body without the scent of the body butter interfering with my perfume blend. And yes, I like the idea of a perfume wardrobe where you have your body butter, and perfume in the same scent, but sometimes, less is more. Thanks Juliette for having the option of scented and unscented body butters for us to purchase.